For the measurement of the surfaces of rotationally symmetric parts numerous axes must be positioned. Furthermore the signals must be fastly transferred in order to detect the position as exactly as possible. To save time, absolute encoders are used because they do not need any reference runs when started. The measurement device consists of a measurement table with a gate. The rotationally symmetric parts are fixed on the measurement table and their surface is tested with a sensor connected to the gate. 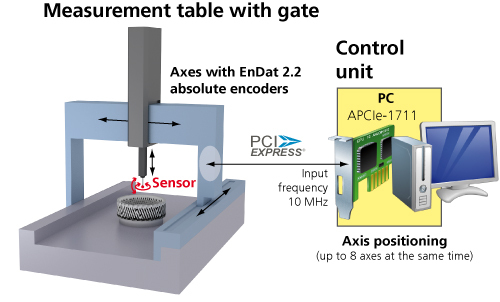 To move the sensor around the parts the gate has several axes equipped with EnDat 2.2 absolute encoders. The precision of the axis position is assured by the PCI Express counter board APCIe-1711: Thanks to its high input speed of 10 MHz and its robustness, the board is able to move the axes precisely even at high speed.